SEAMetal XD is the latest generation of our benchmark SEAMetal double seam inspection system. 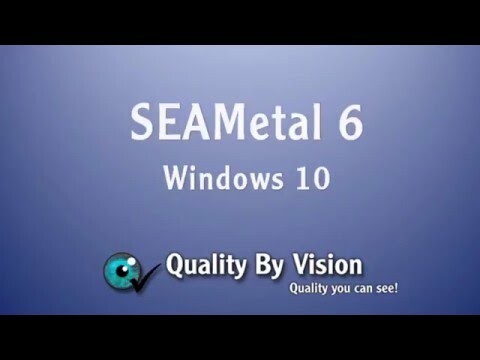 Quality By Vision has been continuously improving and developing this system since 1993, ever since the world’s first automatic double seam scope, SEAMetal 9000X was introduced. SEAMetal XD allows plants for the first time to seamlessly alternate between HD video and tabletop gauge measurements. For example, canning operations that want to be compliant with regulatory bodies with different demands can measure seams using the fast HD camera when they can (during equipment setups, rechecks and changeovers) and use the tabletop gauges for regular seam checks during production runs, if they are so required. The software will take all measurements from either source and display them together in the reports and statistics. The SEAMetal XD system comes equipped with our high definition SEAMetal HD camera and tabletop gauges for mechanical seam dimensions: our industry-standard adaptive seam thickness gauge, our combination tabletop seam height / length, bodyhook and coverhook gauge and our countersink gauge. Overlap can be measured using the HD camera or calculated based on the other gauge readings. This means that for the first time, you can get all the benefits of industry-leading SEAMetal software without having to change your existing seam quality procedures! Free SPC system that’s easy to use, easy to understand, supports drill down directly from SPC graphs down to the seam reports! Record data using keyboard, foot-switch or touchscreen!